In 3D printing, how a powder flows and packs as the layers are formed are defining aspects of its performance. Variability in feedstock can lead to inconsistent bulk density, nonuniform layering, low tensile strength and poor surface finish. Powder characterization has a vital role to play in supporting the 3D-printing process, and testing techniques that can reliably measure properties that correlate directly with process performance are essential. 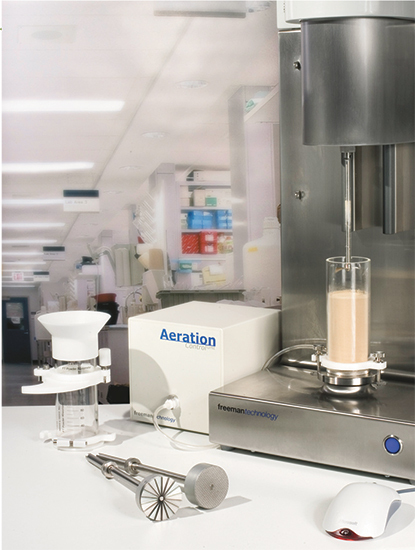 Identifying which powder properties lead to uniform, repeatable performance of powder allows new formulations to be optimized, without the significant financial and time implications associated with running samples through the process to assess suitability, and helps reduce the occurrence of final products that are out of specification. Unfortunately, traditional powder-characterization techniques often are unable to identify subtle differences in properties that can lead to differences in performance. To assist in delivering the best powder possible for the job, Freeman Technology has introduced the FT4 powder rheometer. This universal powder tester provides automated, reliable and comprehensive measurements of bulk-material characteristics. This information can be correlated with process experience to improve processing efficiency and aid quality control. Specializing in the measurement of dynamic flow properties, the FT4 also incorporates a shear cell, and the ability to measure bulk properties such as density, compressibility and permeability. Use the FT4 to determine batch-to-batch variation; process-relevant differences between fresh and used feedstock; the influence of different suppliers and manufacturing methods; and the effect of additives on feedstock properties.